Molecular biologist-turned-photographer Amy Lamb (b. 1944) has always loved plants. She spent her childhood collecting and preserving flora, and built a successful career studying biological structures and their processes. Lamb now uses the camera to create striking large-scale portraits of fruits and flowers. She attributes her shift to photography to a desire to “communicate the beauty I was seeing [as a biologist] and the sense of wonder it was evoking.” Lamb’s imagery doesn’t just begin with the camera—she grows most of her subject matter in her own extensive garden and greenhouse. 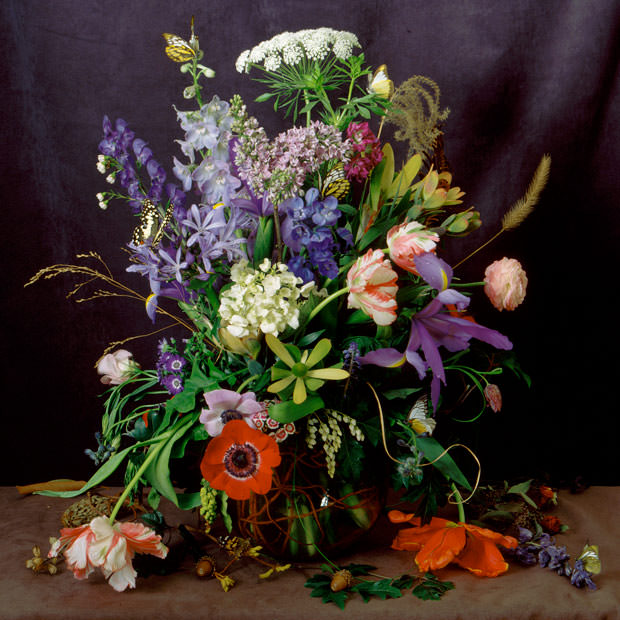 In Vase of Flowers I (1999, printed 2011), currently on view at NMWA, Lamb’s lavish bouquet deliberately echoes flower paintings by artists such as Rachel Ruysch (1664–1750). Like Ruysch, Lamb portrays real flowers and insects, but the resulting composition is not “natural.” Lamb carefully balanced the flowers to achieve the illusion of an overflowing vase, although the pictured vase did not actually have the capacity to contain them all. She also used cold temperatures to ensure that the insects remained still long enough to be photographed. The lush, painterly result demonstrates Lamb’s extensive process along with her emphasis on color, texture, and imagination. For the Spring/Summer 2017 collection, inspired by the poetic Spanish film El espíritu de la colmena (The Spirit of the Beehive) (1973), models were sent down the runway in yellow, white, and black-hued layers of ruffled lace and dotted tulle reminiscent of a honeycomb. Yet, a subject as seemingly serene as a flower garden has deeper implications; that same spring, the North American rusty patched bumblebee was added to the endangered species list for the first time. This entry was posted in From the Collection, NMWA Exhibitions and tagged Amy Lamb, Connecting the Threads, Rodarte, Vase of Flowers I by Women in the Arts. Bookmark the permalink.